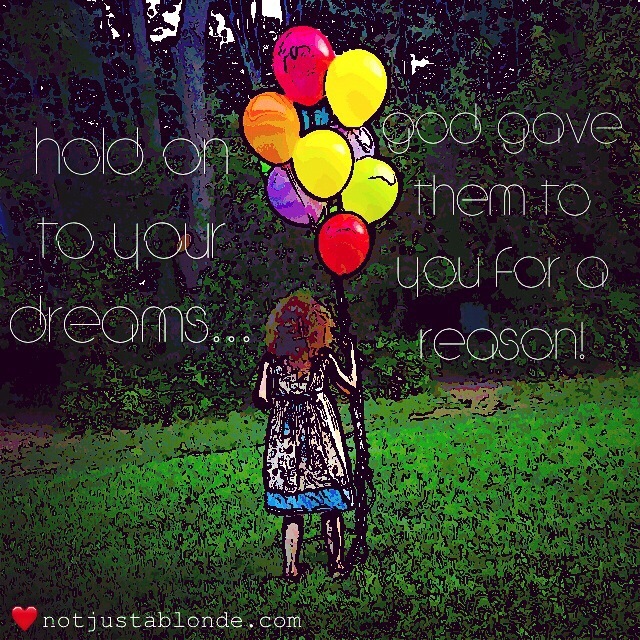 Hold on to your dreams, God gave them to you for a reason! Within each of us is our special purpose and our dreams! Our dreams can inspire us to follow our hearts, and who knows our hearts better than God? God cares for us and desires for us to be happy and whole. God’s vision for us and for our lives is greater than we can ever imagine! Sometimes the dreams we hold may never come to pass in the way in which we’d hoped yet God often has some thing more beautiful in store! Yes, hold on to your dreams yet don’t hold on too tight as God may give you an even better dream to embrace! Ann, You are perfectly correct in saying, ‘don’t hold onto your dreams too tightly,’ because God has always impressed on me the need for me to be flexible, being able to change direction readily, when He/She wants me to do so. One of the most life-changing was the loss of a career after spending 26 successful years in it; another was the loss of the love of my wife (and, to a large extent, also that of my daughter), because of my wife’s hatred for what she thought to be God. [Note that it was love of, not love for].